Greece has appealed for help from other countries to help tackle a spate of fires which were raging uncontrolled in the country on Monday (23 July), its fire brigade said. “Due to the intensity of the fires and the dangers they pose our country submitted a request through the EU Civil Protection Mechanism for international assistance with air and land assets,” a fire brigade spokeswoman said. At least five people have died and more than 20 have been injured as wild fires tore through woodland and villages around Athens, while blazes caused widespread damage in Sweden and other northern European nations. Late Monday, an AFP photographer came across a burned out car with three charred bodies underneath it near the port town Rafina, one of the worst affected areas about 40 kilometres (25 miles) east of Athens. Two more people died Monday while being taken to hospital, public television Ert said, citing the Greek capital’s emergency services Ekav. Ekav said earlier it had transferred 25 people to hospital, among them eight who were seriously injured. The authorities said they were trying to evacuate inhabitants near Rafina using military and port vessels. Police in the town said they found two Danish tourists out of a group of 10 in a boat at sea off the town and were trying to locate the others. “The night will be difficult,” civil protection chief Yannis Kapakis told Ert which cancelled its normal programmes to cover the fires. 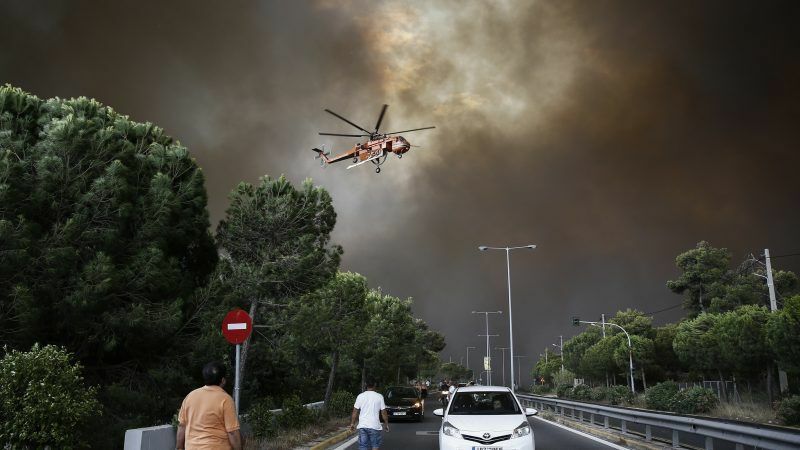 In the north of the country, more than 300 firefighters, five aircraft and two helicopters were mobilised to tackle the “extremely difficult” situation, Athens fire chief Achille Tzouvaras said. The Greek government invoked European Union civil protection agreements to seek help from its EU peers, with the country tinder box dry and at risk of more fires. Video footage showed inhabitants fleeing the fires by car, with several buildings and homes damaged, as the region of Attica — where Athens is situated — declared a state of emergency. “If I hadn’t left, I’d have been burned,” a 67-year-old resident who gave her name as Maria told AFP. Near the town of Marathon, several residents fled to safety along the beach, while some 600 children were evacuated from holiday camps in the area. Tsipras said that “all emergency forces have been mobilised” to battle fires along at least three fronts. Emergency services were banking on a drop in the wind but the forecast for the region — which has experienced temperatures topping 40 Celsius (104 Fahrenheit) — suggest conditions would remain challenging into Tuesday. Smoke from the blazes blotted out the sun over the famed Parthenon temple in Athens, where some ministries closed in the afternoon due to the soaring heat. “I am really concerned by the parallel outbreak of these fires,” Tispras said, with officials raising the possibility they could have been started deliberately by criminals out to ransack abandoned homes. Fires are a common problem in Greece during the searing heat of the summer and can be major killers. Fires in 2007 on the southern island of Evia claimed 77 lives. Also on Monday, Sweden’s civil protection agency MSB said there were 27 active fires across the country, as temperatures were expected to soar as high as 35 Celsius (95 Fahrenheit) this week. 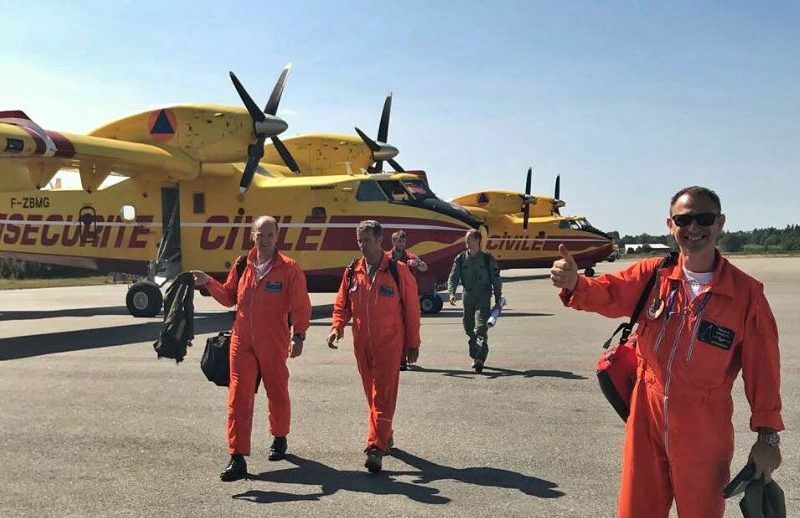 The European Union has successfully coordinated a mass effort to fight the wildfires raging in the Arctic Circle, dispatching planes and firefighters in what has been dubbed “solidarity in action”. Other European countries including France, Italy and Germany have sent a mix of plane, trucks and firefighters to help tackle the blazes as Sweden, where usual summer temperatures are closer to 23 Celsius, has struggled to contain the crisis. Some 25,000 hectares (62,000 acres) of land has already gone up in smoke or continues to burn — an area twice the size of the city of Paris. At least four of the fires had not been brought under control, MSB said, and weather conditions were unfavourable. Sweden is experiencing an unprecedented drought and soaring temperatures which have reached the highest in a century. Sweden is facing forest fires. There has been practically no rain since the beginning of May in the Nordic country, aside from a paltry 13 millimetres in mid-June. The Forestry Bureau said in a statement Monday that the value of the destroyed forests was 900 million kronor (87 million euros). Other northern European nations have been struggling to contain forest fires as the temperature shows no sign of dropping. In Finland’s northernmost Lapland province, fires have ravaged wood and grassland close to the border with Russia. Norway, which this year experienced its hottest May temperatures on record, has also seen several small fires, and one firefighter was killed on July 15 while trying to contain a blaze. Fires have raged for five days in Latvia, destroying more than 800 hectares (2,000 acres) in the Baltic state’s western regions. Meteorologists warned that the high temperatures are persisting and no rain is expected in Latvia for the next two weeks. What a whitewash for the extreme left Greek PM Mr Tsipras. Totally concentrated on his politically survival. There are more than 60 people dead and the only thing the government keeps saying to justify their inaction and unpreparedness, is that it is an ‘extreme event’, as if being at the helm of the government is just making trips and photos. This is huge mistake in organisation of fire fighting in Greece. Extreme left communist Greek PM Mr Tsipras is to blame.